We heartily recommend the Edge's optional Vista Roof. 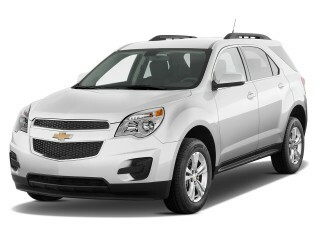 It's very large, but doesn't cut into head room as much as the panels you'll find in other crossovers. The 2012 Ford Edge rises to the top of the five-seat crossover niche with forward-thinking technology and a gas-saving EcoBoost option. 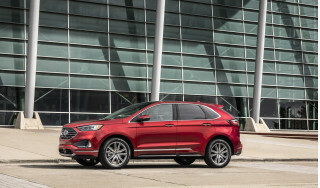 It's not radically reinvented, but the latest Ford Edge is a substantial, beefy five-seat crossover with some compelling features--features like real adult interior room, the tech-savvy MyFord Touch system, even the simply appealing Vista Roof glass panel. The heavily refreshed Edge was new for 2011, and this year has a new addition to the lineup in the form of an EcoBoost engine, a turbocharged four-cylinder with comparable power to the base V-6, with a highway gas mileage rating of 30 mpg. The standard six-cylinder remains available in 285-hp form, and the Edge Sport returns with its 305-hp six and sport tuning. 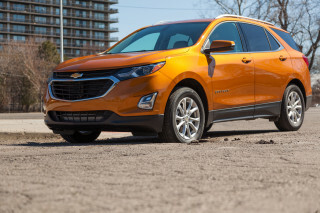 All versions have a firm but not busy ride, relatively quick steering, and the kind of predictable tall-wagon handling that makes them great choices for family commuters and carpoolistas--even the Edge Sport, with its massive 22-inch wheels. 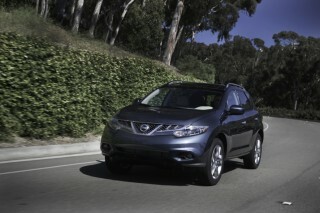 The Edge hasn't earned the best safety scores from the NHTSA, but the IIHS calls it a Top Safety Pick. With standard curtain airbags and anti-lock controls, the Edge can be upgraded with blind-spot monitors, parking sensors and a rearview camera, but it lacks the latest options for features like inflatable rear seatbelts found on the seven-seat 2012 Explorer. All Edges get a USB port for music players; a capless fuel filler; and MyKey, which lets parents program in speed and volume limits for their younger drivers. Then there's MyTouch, which uses Bluetooth and touchscreens to take the place of dozens of buttons and switches, rendering the dash neat and clean while relying on voice or steering-wheel-button commands to drive secondary vehicle functions like navigation and climate control. With styling refreshed and warmed up nicely in 2011, the Edge's main selling points are its stylish and spacious interior, the advanced technology on board, and now, the promise of 30-mpg fuel economy. If you're seeking a truly sporting edge, you'll probably need to spend more for a German SUV with less interior space, though. With a bit more starch in its sheetmetal, the 2012 Ford Edge cuts a cleaner profile than its first-gen ancestor. The styling theme's familiar by now, but the 2012 Ford Edge comes off more elegantly than the first-generation crossover did. The grille's gone deep, in a Volkswagen way--one wonders if Bobby Flay takes it as a personal challenge to his manhood. The silhouette's changed less, but what is there has been crisped up, with more pronounced fenders and emphatic taillamps providing the fillips on what's really a very clean, almost plain design. The Edge's interior received a complete makeover last year, and nothing's changed for the 2012 model year. The latest design has better materials, softer-touch plastics, and a finer aesthetic appeal, with less blocky shapes, though we've had about enough of the mock carbon fiber trim found on SE and SEL editions. The 2012 Ford Edge is responsive and strong, and more satisfying to drive than many other crossovers--even with the turbo four. Until this year, the Ford Edge has been available only with six-cylinder engines. For 2012, Ford's brought fewer cylinders to the party, but with turbocharging, the newest drivetrain's a solid option for those wanting 30-mpg highway ratings under the hood. 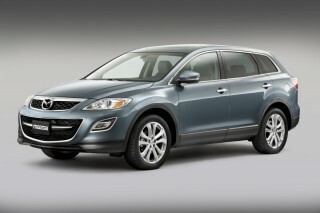 The base engine on the 2012 Edge continues to be a 285-horsepower, 3.5-liter V-6. With 20 more horses than it had in 2010, the engine spins out plenty of torque to move the Edge with authority. With the smooth-shifting six-speed automatic, it's a drivetrain made for cruising, though the quick throttle tip-in can make urban takeoffs a little jerky. 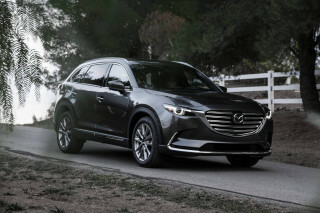 All-wheel drive is an option, and it adds almost 200 pounds to the Edge's already hefty curb weight of about 4000 pounds. One step up the pricing ladder is the new EcoBoost option. Available for $995 on any Edge except the Sport, the EcoBoost turbocharges a 2.0-liter four-cylinder, applies direct injection and teams it with a six-speed automatic and front-wheel drive. We've driven the new engine in both the Edge and the Explorer, and in the Edge it's a much better alternative to the V-6, thanks to the Edge's lower curb weight. The boost comes on low in the rev range, giving the Edge EcoBoost perky acceleration that's only about a second off the six-cylinder in the 0-60 mph run. Fuel economy of 21/30 mpg is a magnitude better than V-6 mileage, and there's just a bit more four-cylinder noise to endure to get that fuel economy. We're eager to see how many shoppers will pay more for fuel economy, and how long Ford holds out until rising EPA gas mileage standards force it to cut the price of the more efficient four. Above all these versions, the Edge Sport offers a 3.7-liter V-6 with 305 horsepower, the same as it does in the Mustang pony car. With paddle shifters, it's the straight-line runner of the group, but fuel economy drops a lot, especially with all-wheel drive. Without a third-row seat, the 2012 Ford Edge focuses on great passenger room for five adults. It's a mid-sizer by its exterior measurements, but Ford has skipped a third-row seat in the 2012 Edge, leaving that extreme duty to its Flex and Explorer crossovers. The Edge has just two rows of seating in its tall wagon body, and that translates into plenty of space for all passengers. In front, a pair of bucket seats comes with at least some power control. On base models, the driver seat is fully powered--but the passenger seat only has a power base, with a manual rake lever to recline. Higher trim levels offer 10-way power-adjustable seats, nicely trimmed and comfortable, with lots of head and leg room surrounding them. The back seat is also adult-sized, and adult-shaped. Ford says the Edge has best-in-class second-row leg room, and it's tough to cast doubt on that suggestion, given the inches of spare room we've seen with four adults on board--and space for a child left on the rear seat. The rear seat backrests also recline to an excellent position for long-distance comfort. Crash ratings aren't quite as high as some crossovers, but the 2012 Ford Edge offers some of the latest safety technology as options. It's not the safest crossover vehicle you can buy, but the 2012 Ford Edge still performs fairly well in federal crash tests, and earns top scores from the insurance industry. The Edge gets an overall rating of four stars in the revised, more stringent crash tests performed by the National Highway Traffic Safety Administration. The NHTSA's sub-ratings include three-star ratings for frontal impact and five stars overall for side impact. That's better than average, though less convincing than the old five-star rating it earned in prior years. Standard curtain airbags and stability control are joined by features such as hill-start assist, which keeps the Edge from rolling backward at stops; trailer sway control, which has been adapted from Ford's F-150 pickup trucks; and adaptive cruise control and collision warning, which use radar sensors to figure the distance to the car ahead and to detect imminent collisions. Ford also offers a blind-spot monitor system, which flashes a light on the outside mirrors when a car in in the adjacent lane out of sight; cross-traffic alert can sense traffic approaching from the side when backing the car out of a parking space. The Edge does not offer the inflatable rear seat belts that are found in the mechanically similar 2012 Ford Explorer, though. 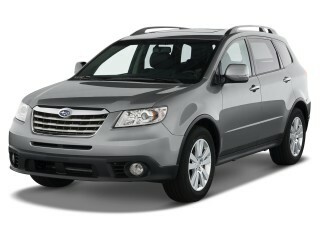 The 2012 Ford Edge sports the latest in-car technology; well-optioned models sport Lincoln-like prices. 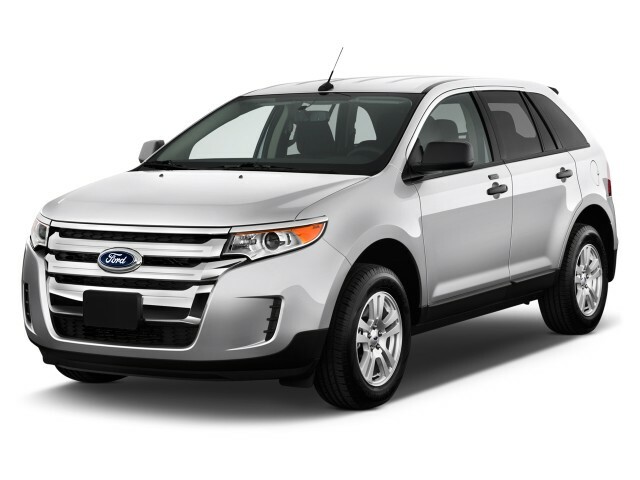 The 2012 Ford Edge is well equipped in base form, from SE to SEL and Limited trim levels. 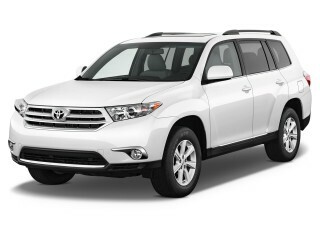 All versions include air conditioning; tilt/telescope steering; power windows/locks/mirrors; a CD player with an auxiliary jack; and 17-inch wheels. 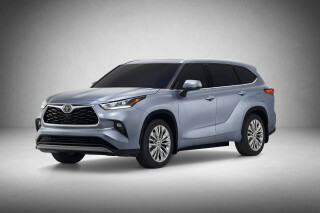 Opt into the SEL and the Edge gets power front seats, rear parking sensors, satellite radio and 22-inch wheels, as well as SYNC, the Bluetooth-driven system that allows drivers to control audio and phone features with voice commands. Limited models add leather upholstery and a rearview camera, Sony audio and HD Radio, and MyFord Touch, undoubtedly the high-tech calling card that made its debut in the Edge. With its new EcoBoost option, the 2012 Ford Edge ranks near the top of its class for fuel economy--but the Sport edition brings it back down to earth. For the 2012 model year, the Ford Edge gets a serious fuel economy boost by the way of turbocharging. However, its V-6 versions still have only average gas mileage. The new EcoBoost option is available on Edge SE and higher trim levels. 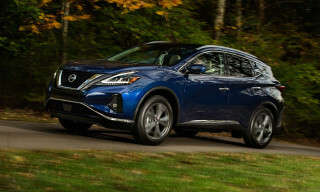 It features a 2.0-liter turbocharged four-cylinder engine and six-speed automatic for a net of 240 horsepower and 270 pound-feet of torque. Ford says it will earn an EPA highway rating of 21/30 mpg, excellent numbers for the five-passenger crossover market. The engine's not alone in its hard work: direct injection is a big factor in fuel economy, but Ford also uses lower rolling-resistance 18-inch tires to cut down on friction, while it also employs an active aerodynamic grill that closes at lower engine temperatures, improving airflow and reducing drag. Other models aren't quite as frugal. The front-drive Edge with Ford's 3.5-liter V-6 is rated at 19/27 mpg; adding all-wheel drive drops figures to 18/25 mpg, which is where the 3.7-liter Edge Sport starts out. An AWD Edge Sport has the least efficient drivetrain, at 17/23 mpg.